1. I attended a talk a while ago by an author (whose name escapes me at the moment), who mentioned this alliteration approach as a useful technique for people to remember you and your work. Lisa... first name Lisa.... Lisa Horn? [Sorry, it's Sam Horn] I'm following her on LinkedIn. I don't think I have her book. She was also making the point that people have very short attention spans. The cover of her book is a fish... something related to the attention span of a goldfish. 2. Made to Stick... that was another book by the Heath brothers (Chip and Dan) which had to do with attention span. Really? I'm not sure that was about attention span at all. Wasn't it about change, behavioral change, adopting new habits? Is there a point to this stream of consciousness? Let's just say that like everyone else, my memory isn't perfect but there are always remnants of memories or connections that can be recalled, however imperfect they are. Why I liked this book? Dr. Blair's book is a very nicely written, practical approach to personal information management. Given that 1) our capacity for absorbing information has limits; 2) we keep getting bombarded by information sources (many of which we purposefully seek out), how can we make the most of the wealth of information that surrounds us, not to mention deal with information validity? I also really appreciate the approach because it's not just about information management from a time management perspective. It treats the subject with a strong learning focus. 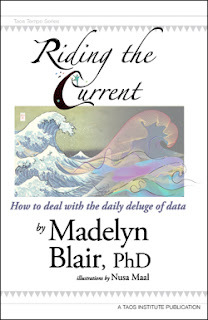 Finally, Dr. Blair stretches the "riding the current" metaphor throughout with chapters like "selecting the vessel", "finding the right crew", etc... which adds a little fun. Who wants to read a boring book? Who actually reads books these days? Who has time? Who takes the time? How does it fit with Knowledge Management? This book fits squarely in what I refer to as Personal Knowledge Management (PKM). Individuals who have a strong awareness of their own personal knowledge management are more receptive to KM and organizational learning efforts at the team, project and enterprise-wide levels. I suppose that's a hypothesis more than a fact-based assertion. Oh.. Madelyn Blair is also delightful in person. If you hear she's doing a talk in your neck of the woods, go for it.